OKLAHOMA CITY (AP) This was the Paul George that Thunder fans had been waiting for. 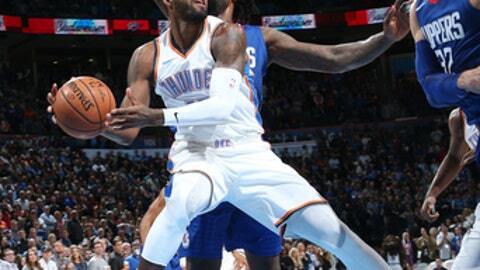 George scored 42 points and Oklahoma City snapped a four-game losing streak with a 120-111 victory over the Los Angeles Clippers on Friday night. It was George’s highest scoring performance since joining the Thunder in an offseason trade with Indiana. He said his new teammates are starting to figure out how his game works. Russell Westbrook had 22 points and eight assists in the Thunder’s highest-scoring game of the season. Carmelo Anthony and Alex Abrines each scored 14 points. Westbrook and Anthony made it tough for Los Angeles to deal with George. George made 13 of 22 shots and had nine rebounds and seven assists. Lou Williams scored 35 points for the Clippers, and Blake Griffin had 17 points on 5-for-19 shooting. Los Angeles has lost four straight. The Thunder led 63-55 at halftime behind 21 points by George. The Thunder continued their surge early in the third quarter. A 3-pointer by Anthony pushed Oklahoma City’s lead to 15. The Thunder increased their advantage to 20 before the Clippers chipped away late in the quarter to close to 94-86 at the end of the period. A 3-pointer by Austin Rivers tied it at 105 midway through the fourth, but the Thunder held the Clippers to one field goal in the final three minutes to regain control. Clippers: G Jawun Evans, who played at nearby Oklahoma State last season, scored three points in 16 minutes. … G Patrick Beverley sat out with a sore right knee. F Danilo Gallinari missed the game with a strained left glute. … G Sindarius Thornwell got his first career start in place of Beverley and scored 10 points. … Williams hit a double-clutch shot from half court to end the first quarter. He was called for a technical foul in the fourth. Thunder: C Steven Adams missed the game with a right calf contusion. … Dakari Johnson got his first career start in Adams’ place and finished with nine points. He was a G-League All-Star last season. … George hit a short jumper at the halftime buzzer. He was issued a technical foul in the third quarter. … G Andre Roberson had 11 rebounds. Each of the Thunder’s wins has been by at least nine points. All their losses have been by nine or fewer. Even with a 5-7 record, the Thunder have outscored their opponents by 58 points this season. Jordan finished with nine points and 12 rebounds. Griffin had five assists to surpass 2,000 in his career. He led the team in assists, and the team finished with just 13. Clippers: At New Orleans on Saturday night. Thunder: Host Dallas on Sunday night.